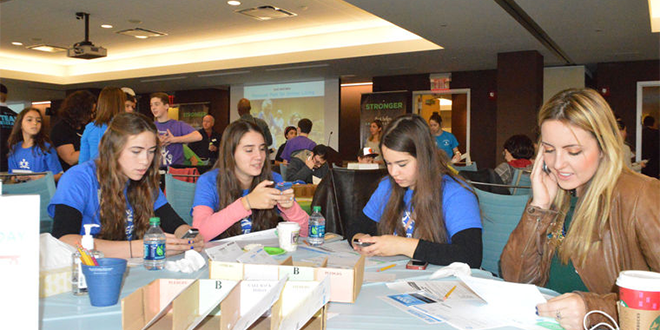 Courtney Fishman, one of eight co-chairs of the event, said the co-chairs expect 800 to 1,000 volunteers to make calls in support of the Federation’s 2016 Campaign for Jewish Needs on Super Sunday. A total of $1,053,430 was raised during last year’s phone-a-thon, and Fishman said the goal is to raise even more this year. The Campaign for Jewish Needs helps the Jewish and general communities in Greater Cleveland, Israel and 70 countries around the world. Ninety-one cents of each dollar donated goes directly to the community for programs and services. 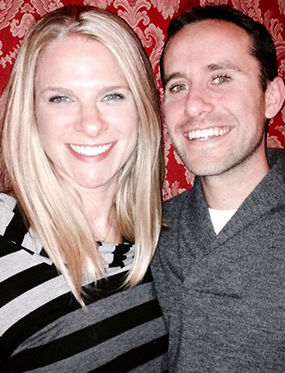 Fishman, 33, and her husband, Robert, of Moreland Hills, are serving in their second year as co-chairs of the event. The Fishmans, who belong to B’nai Jeshurun Congregation in Pepper Pike, decided they wanted to become involved with the Federation after they moved back to Greater Cleveland from New York in 2012. The other co-chairs of this year’s event are Rochie and Jordan Berkowitz of University Heights, Lisa and Phil Linden of Pepper Pike, and Katie and Rabbi Ari Spiegler of Beachwood. Rhoda Seifert, of South Euclid, has been volunteering at Super Sunday for at least 15 years. She also has taken part in many of the other campaign dialathons that the Federation has hosted over the years. “I think (Super Sunday) is a wonderful thing that they do, and it gets different organizations involved,” she said. “I signed up for 9 (a.m.) to noon, but I probably will stay there longer. 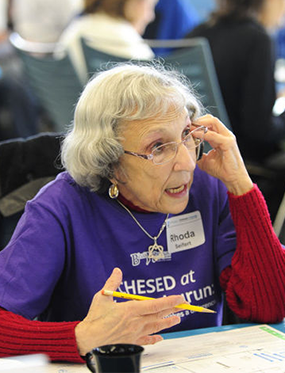 Seifert, 81, is past president of both the Montefiore Auxiliary, now known as Montefiore Volunteer Partners, and the sisterhood at B’nai Jeshurun Congregation, where she remains active. She also volunteers for Red Cross blood drives and was a volunteer in the Israel Defense Forces about 20 years ago. “I’m very into raising money for Jewish causes and for Israel,” she said. Seifert said she’s been told she’s very good at soliciting donations on Super Sunday. She said she couldn’t remember the most money she’s ever raised on a single day. Seifert said she does not set a goal as to how much money she wants to raise on Super Sunday. 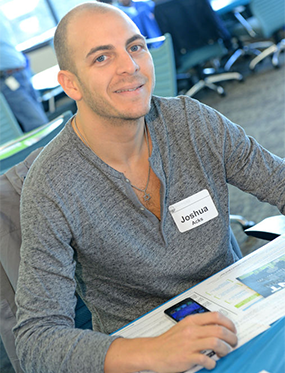 Josh Acks, of Cleveland Heights, is a member of the Federation’s Young Leadership Division board and very involved in the Campaign for Jewish Needs. This year will be his third as a Super Sunday volunteer. Acks, 30, said he found “comfort in numbers” in being joined by people he knows when he’s making calls to potential donors. “It’s a lot easier than going by myself, because asking people for money is a difficult thing to do,” he said. “It’s a fun atmosphere. Acks, who does not belong to a synagogue at this time, said the only specific goal he has set prior to Super Sunday is to have more than half of his solicitation cards closed before he walks in the door. Volunteers are still needed and may choose from five shifts: 9 a.m. to noon, 11:30 a.m. to 2 p.m., 1:30 to 4 p.m., 3 to 5:30 p.m. and 4:30 to 7 p.m.
Child care for infants and pre-kindergarten children is available by reservation from 9 a.m. to 6 p.m. Activities for children in kindergarten through sixth grade will take place from 11 a.m. to 4 p.m.
Kosher meals and snacks will be provided. Sponsors of Super Sunday are KeyBank, Benesch and the Cleveland Jewish News.